by William "Bill" Lellis, Larkspur Fire Chief, retired. Manufacturing in Ross? Hard to imagine in this posh community where the median home value is $2,655,800 as of 2016. Home to the wealthy and even celebrities, there is no sign today of what was once a thriving business making and selling sirens and other fire equipment, including nozzles, to the American fire service. Throughout the history of the fire service the names of the inventors of equipment are scattered throughout the pages of books. People such as Parmelee, Higby, Halligan, and Blake. Years ago while visiting a good friend of mine, Fire Chief Ron Nelson of Burney, California, we got to talking about old equipment. Ron then said “follow me”, and up we went to an attic of sorts in the Burney fire hall. He went into a corner of the room, leaned over, and with a little grunt, picked-up and turned toward me and said “…would you like this?” He was holding a C.A.M. fire siren, a very old siren. Without hesitation I immediately said “of course”, and I was now the proud owner of a C.A.M. Siren. 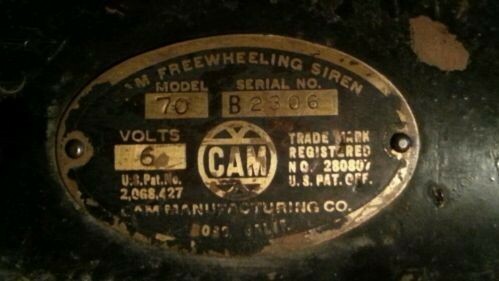 At the time I knew nothing about sirens, but knew that this one was part of local fire service history since it had been made in Ross, California. The siren then sat for many years on a shelf in my garage, as a project I always was going to get to. Then a few years back a group of us from Marin decided to start documenting the history of the Marin fire service. So the project began. 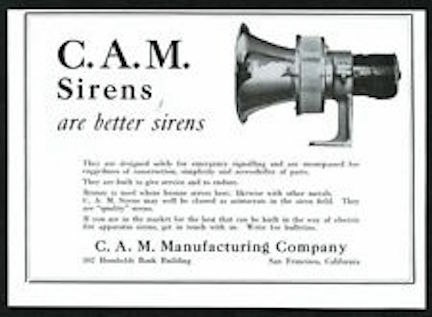 At one point I remembered the siren in storage, and told my good friend Chief Bob Marcucci that I was looking for some information regarding the siren. He mentioned he had met a gentleman who lived a few streets above him in San Rafael. His name was Louis Soldavini, also known for many years as “one-eyed Louis” to the guys down at the old downtown San Rafael fire house on C Street where Bob had worked. The C.A.M. 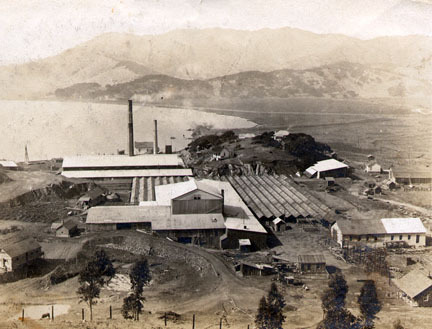 Manufacturing Company began business in 1924, but had long been out of business. So the odds of finding a person who worked there was a long shot. I called "information" on the phone, and to my surprise they found a listing for Mr. Louis P. Soldavini. My thought was - if Louis did work on the siren, would he still be alive? So I called the number the operator gave me. Thinking a daughter or son of the man would answer the phone, a gentleman answered the phone. I said I was looking for a Mr. Soldavini who worked for the C.A.M. Manufacturing Company in Ross, thinking by the tone of the mans voice that I was talking to his son. I explained who I was and what I was in search of, and to my surprise it was the Louis Soldavini who had worked for the siren company. His voice and manor was as 'sharp as a tack.' We set up a time and date to meet at his home for an interview, and to ask the many questions I had about the siren. Just before we hung up, I inquired if I could ask a personal question. He agreed, and I asked "how old are you?" He asked me to take a guess. I said 80? “I’ll be 95 tomorrow”, he said with great enthusiasm. We agreed on a date to meet, and so on a Saturday morning, Bob Marcucci and I sat down and listened to his story on a piece of Marin County’s history, the C.A.M. siren. Louis sat in the middle of his living room, where above him on the wall were four large mounted animal heads. The heads of two caribou and two Big Horn Sheep were displayed. In a spare bedroom was a Cape Buffalo, and an American Bison was yet to mounted on the wall. Antonio Soldavini immigrated to this country in 1903 from Milano Italy, where he had trained to be a baker. Like many Europeans, Antonio had come to America seeking a new life, searching for the rumored riches in the gold fields. About 10 years later in 1913, he returned to Italy after receiving word that his mother was dying of cancer. It was here that he met his future wife, the beautiful Lorna. A short courtship began, followed by a wedding in Italy. Antonio then brought his bride back to America. They settled in San Rafael, where he found work at the McNear Brickyard, which was working full-time making bricks to help rebuild San Francisco after the 1906 earthquake and fire. He later started a landscaping business on his own, and purchased property in San Rafael. Louis was born in 1916, on Clorinda Ave in San Rafael. He was the second Soldavini child, following his older sister Annette. Louis began his education at the Short School on Marin Street in San Rafael, less than a block from his home. Sadly, his father Antonio died in 1924 at the age of 40. His mother Lorna sold the property, and, in 1929, booked the family on a freight and passenger steam ship out of San Francisco, through the Panama Canal to Genoa, Italy. The voyage took 35 days, making calls at every port on the coast and through the canal. His mothers intention was to stay only six months, but that also changed. Six years later when Louis was 19 years old, in 1935, his family returned to San Rafael. They were fleeing the political climate and war. Italy had started a war with Ethiopia in October of 1935. They won in a little over seven months, and occupied the country with their military. In addition, a larger war was looming in Europe. The Italian victory coincided with the peak of the international popularity of dictator Benito Mussolini's Fascist regime. Mussolini's popularity later fell when he endorsed the "Anschluss" between Nazi Germany and Austria. This was the German propaganda term for the annexation of Austria. This support to the Nazi's from Italy started a political tilt toward Germany, that would later destroy Mussolini and his Fascist regime in World War II. While in Milano, Louis was asked by the mayor of the town to go down and enlist in Mussolini’s Air Force, but being an American citizen he was exempt, and he refused service. Louis was very fortunate that during his six-year stay in Italy he was taken in as a blacksmith apprentice. It was here where he learned the trade which would serve him the rest of his life. Louis held many jobs before going to work for the C.A.M. Manufacturing Company. One was working in a Blacksmith shop where he also learned the welding trade. He proudly told us of many homes in San Rafael that displayed his decorative iron works around decks and windows. The C.A.M. Manufacturing Company shop was on Winding Way in Ross, off Laurel Grove to Canyon. The San Francisco Earthquake and Fire of 1906 would play an important role in the evolution of the company. After the quake and fire, it was noted that many of the downtown buildings had withstood the massive earthquake. Many of these buildings were designed by an Architect named Conrad Meussdorffer, who lived on Laurel Grove in Ross in a home he designed. Conrad Alfred Meussdorffer was born in San Francisco on October 25, 1871. He was the son of German immigrant parents who had settled in San Francisco in 1853. His father Konrad imported and sold hats through his business on Kearny Street. The younger Meussdorffer started work in 1892 for the architectural firm of Salfield & Kohlberg, initially as a draftsman, and two years later was promoted to architect. In 1895 he became partners with Victor de Prosse, mainly designing commercial buildings, and two years later, in 1897, he opened his own practice. Conrad was responsible for several other client homes in Ross. 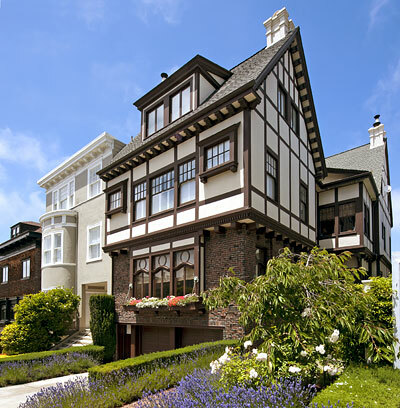 Many of the homes and buildings he designed remain in San Francisco. In Pacific Heights, examples of his early work may be seen at 3016-18 Clay (1897), 3051-55 Clay (1902), and 3295 Clay (1904), along with several others from later in his career. The first letters in Conrad's name is how the company name came about. The C.A.M. Manufacturing Company was started in 1924, by his son, Conrad Peter Meussdorffer, Jr. An inventor, he was a graduate in 1913 of the University of California at Berkeley, with a degree in Mechanical Engineering. Louis went to work for the company in 1935. The business only had two to four employees at any given time in its' history. They initially built large warning sirens that were 18” in diameter. Many were mounted on the top of the town or city halls across America. They were used to warn the citizens of a pending emergency, or to summon the local volunteer firemen. 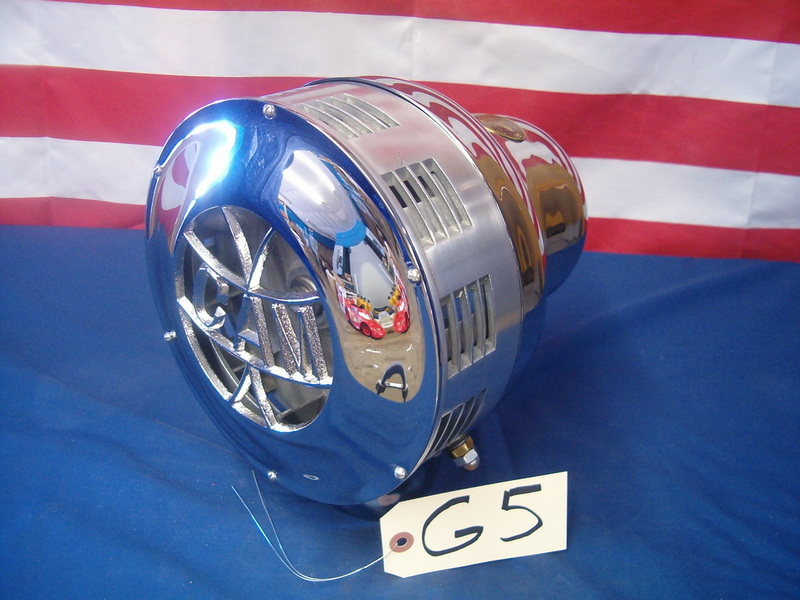 Most firehouses had similar sirens on their rooftops. 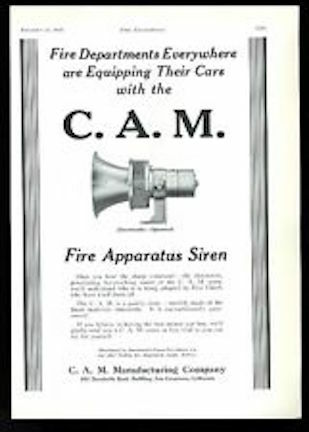 Fire horns and sirens were used to alert the volunteer firemen of a fire, and to summon a response to the fire hall, before the age of two-way radios and pagers. C.A.M. 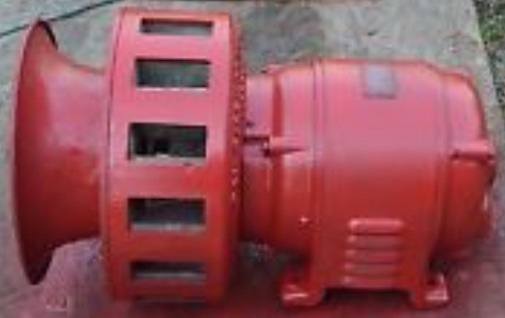 Manufacturing Company also eventually made fire hose nozzles and various fire equipment for the fire service, that were sold across the country. Louis was at one point severely injured at work, when they were moving a vat of molten brass to a workbench. Louis' handle broke, and the entire contents of boiling brass fell at his feet. Striking the ground, it splashed up the left side of his body, where he received third degree burns and loss of one eye. Louis was back to work after ten weeks of recovery. The C.A.M. Manufacturing Company was later sold to the Santa Rosa Nozzle Company. Louis was asked to go to work for them, helping to manufacture and design new models. The company was then sold to a Sacramento firm, and later passed into history. Today Louis at 100 years old is still a very vigorous outdoorsman, still hunting for that illusive big game trophy. To keep busy these days, Louis is rebuilding an antique automobile. He could not find all of the parts for the motor, so he has designed a mold for them, and will have them made for this project. His mother Lorna Soldavini passed away in 1980, and his sister Annette is still alive, living in Sonoma County in a care home at 101 years old. It was a pleasure for me to meet and listen to a living piece of Marin County's fire history. 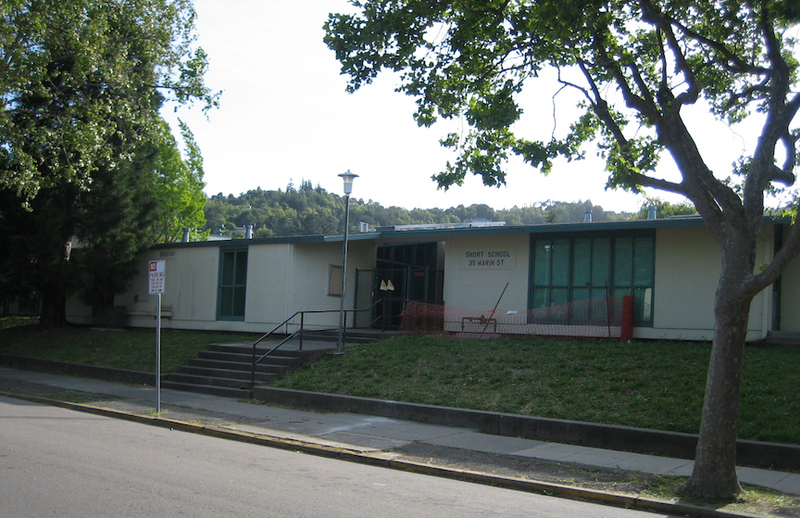 The Short School in San Rafael today, where Louis attended. On October 25th, 1936, an Axis was declared between Italy and Germany.Benito Mussolini pictured with Adolph Hitler. 3320 Jackson Street in San Francisco, designed by Conrad Alfred Meussdorffer in 1906. 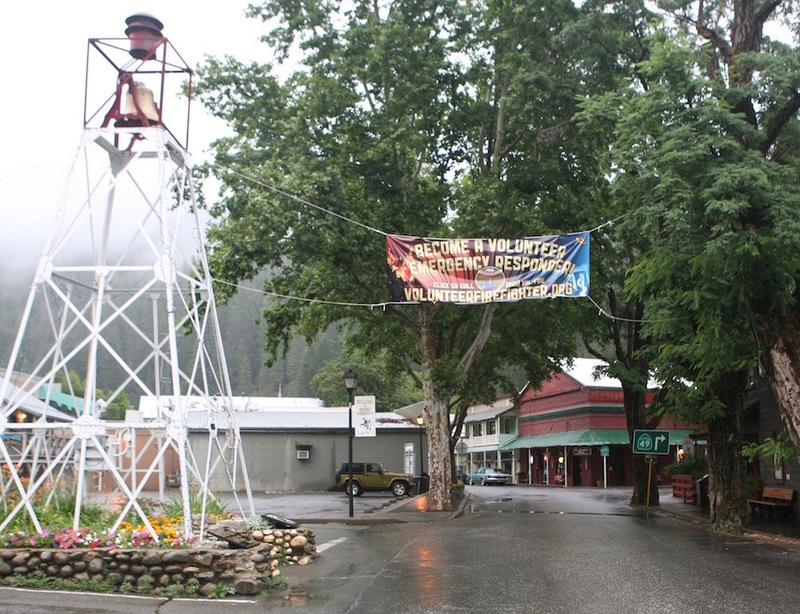 An example of a small town warning and fire siren, in this case in Downieville, California. ​A video interview with Louis Soldavini below, click on the symbol between vimeo and HD for full screen. CAM & Louis Soldavini from Tom Forster on Vimeo.